This is a recipe that’s going to bridge summer into fall, Oh gosh, I said the “F” word, didn’t I? But here it is, mid-August and I know it’s hard to believe it’s all going to be over soon. The kiddos are/will be back at school. We’ll be thinking sweaters and boots. And the long lazy summer days are going to be behind us. This recipe really has it going on. It’s got some of the roots, sweet potatoes, parsnips (do you eat those? I’m just wild about them. They’re like a carrot with some personality) and carrots. Then there’s the red onion that cooks down to caramelized sweetness, some poblano pepper strips for a little zip and zucchini. Lots and lots of zucchini, which isn’t necessarily my favorite, but just about stole the show. It was seriously indescribably delish! 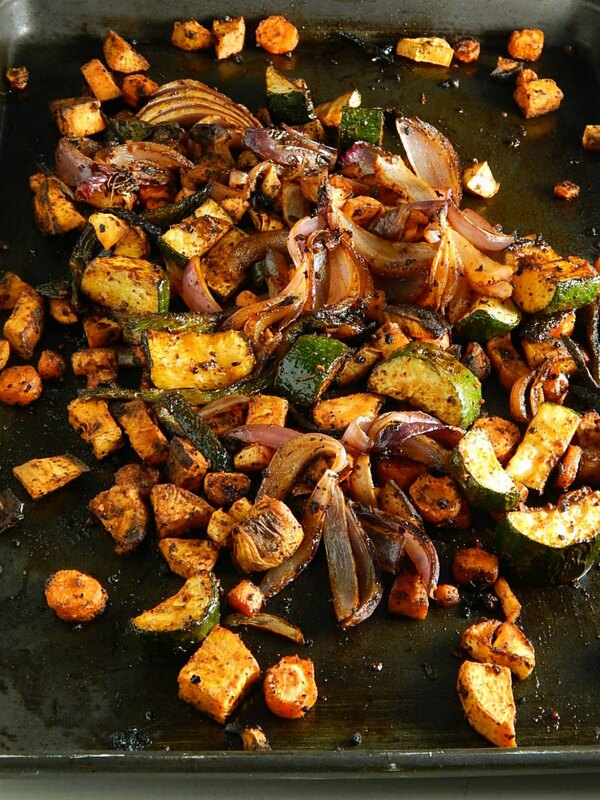 The best part about Smoky Sheet Tray Roasted Vegetables is the huge flavors. Not hot flavors, no not at all, Just as the title says, Smoky flavor from the ancho chiles (anchos are mild) to the Smoked Paprika, the copious amounts of garlic and the poblano strips. Those poblanos all but melt into the veggies. Not one flavor stood out, it was just a perfect melange of flavor. I lifted this recipe from the Washington Post. They lifted it from Sunset magazine. Back in the 70’s my Aunt from California used to save her Sunsets for my Mom (we lived in Iowa) and I remember how I used to thumb through it looking at all the recipes. And all the veggies we didn’t have access to! Just thinking about Sunset magazine brought back some good memories for me. And it goes to show that even then, as a 14 to 15 year old, I was reading food magazines, lol! I also read every issue of my Mom’s Gourmet, cover to cover. What a geek, huh?! I guess today, looking at all the kids in the kitchen on tv, it doesn’t compare, though. Back then was a different story, tho. The point of this recipe (it makes a huge amount, about 12 cups of veggies) is to cook once and then refashion them into different meals, or maybe freeze some of them for later. That being said, Smoky Sheet Tray Roasted Vegetables would be marvelous at a big family dinner party. Maybe Thanksgiving. Sorry, sorry, I know it’s still summer. I’m really jumping the gun, now. This recipe is easy to cut in half if you want. You might be sorry though, they’re so delish you’ll just want to snack on them and they’ll be gone before you know it! I made my Smoky Sheet Tray Roasted Vegetables in the oven. Actually, I cooked them ahead and had them roasting before I went to bed so I didn’t mind heating up the kitchen. It goes without saying, don’t do this if you’re in danger of nodding off in the evenings, though. These could also be made in foil packets and done on the grill, but you will want to put them into two packets. larger packets are unwieldy and prone to leaking when moved. If two packets will take up all your grill space, cut the recipe in half. Other than that, there’s really nothing to the recipe. I roasted my poblano ahead of time and peeled it, but after seeing how beautifully browned all the veggies were, I think that step could have been skipped altogether. Just make sure you use veggies you love and feel free to use this recipe as a guide, substituting with your faves. And don’t be afraid of the amounts of the spices, it’s really just right. It pretty much goes without saying that if you want to bring Smoky Sheet Tray Roasted Vegetables at a budget, choose your vegetables wisely. If zucchini is expensive, maybe summer squash is on sale. If poblanos are super pricey, maybe green bell peppers can be a good substitute. Always try to be open-minded at the market and use more of the less expensive veggies punctuated with smaller amounts of the pricier ones. You’ll find good prices on Olive oil at both Costco and Aldi. I also watch for sales on olive oil at my grocery. It’s highly competitive, especially when a new brand hits the market. If you do have a large bottle or jug, consider decanting it into two smaller bottles. Use one and keep the other in a dark cupboard. Do make sure to have recipes in mind to use all of your Smoky Sheet Tray Roasted Vegetables, or divide and freeze so they don’t languish in the fridge. They’ll be fantastic with almost any protein, salmon, chicken, and pork, especially. I’ll also be a beautiful salad using these veggies. Photo shown above. Position oven racks in the upper and lower thirds of the oven; preheat to 425 degrees. Have 2 large rimmed baking sheets at hand. Do not line sheet trays with foil. Combine the sweet potatoes, onion, zucchini, poblanos, carrots, and parsnips in a large mixing bowl; toss with the oil, garlic, ground ancho and smoked Spanish paprika. Season with salt and pepper to taste. Divide the mixture between the baking sheets, spreading it in a single layer. Divide any remaining oil in the bowl as well, drizzling over the vegetables. Roast for about 30 minutes, stirring and tossing every 10 minutes or so. You will need to use a wide thin spatula to scrape up the spices that settle to the bottom of the pan. If foil-lined, it will be impossible to do. Combine all ingredients in a large bowl. Divide among two large sheets of heavy-duty aluminum foil. Fold around mixture, crimping edges to seal. Grill, covered, over medium heat for 40 to 45 minutes to an hour or until sweet potatoes are tender, turning two to three times. Open, being careful of the hot steam. The roasted vegetables can be refrigerated for up to a week or frozen, preferably in freezer-safe plastic food storage bags, for several months. Use in the related recipes, or allow to cool, then store as desired. Note: I roasted and peeled the poblano before slicing and adding to the recipe. I think this extra step could be skipped as the vegetables brown so beautifully. I’ll be sharing Smoky Sheet Tray Roasted Vegetables at Fiesta Friday 236, hosted this week by Julianna @ Foodie on Board and Debanita @ Canvassed Recipes. Stop by and take a peek at their sites. You’ll love Julianna’s food – everything she makes has a special touch that takes it over the top. I’ve only just begun exploring Debanita’s blog, but the scope of her recipes is outstanding! You never know what you’ll find. This entry was posted in Click here for Bargain Meals, Click here for Fabulous Food Posts and tagged Carrots, hearty sides, Oven Roasted Vegetables, Parsnips, Poblano Peppers, Red onion, Side, Sweet potato, Vegetable Side, Zucchini. Bookmark the permalink. I am all over this like white on rice! Gotta get some veg and then it’s in my belly! 🙂 It’s so simple and so good, Jaxx. Yum! This is definitely my go-to way to cook veggies, I especially love those big chunks of onion scattered in! Thanks!! The onion was so good, I ate all the ones on my plate first! But the zucchini was the big dark horse winner! This looks too tempting!! Wonderful recipe. Root veggies are a mainstay over our way and roasted root veggies is how we cook’m in our house. But, I’ve never thought to use the ancho chili powder or the smoked paprika. I think it’ll give it a great taste and go well with homemade flour tortilla and a grilled chicken steak. We love parsnips, especially pureed with lamb. Sorry to reply late, Ron, missed your comment! I think a steak would only improve these veggies, lol! I love parsnips, too, probably the most out of all the roots except potatoes. Parsnips would be so lovely with lamb! I love roasted veggies and these look wonderful! Did you find that the carrots and parsnips cooked through? I usually pre-boil or saute them because I don’t like them to be too crunchy. By the time they are cooked, the zucchini has melted away to nothing. Yes, the carrots and parsnips cooked through, they’re in smallish chunks, only 1/2″ and the zucchini is largish. The zucchini is quit soft and just a but towards the mushy side, but its supposed to be that way for this recipe. It could be tossed in 10 minutes later at the first turning and it will be firmer at the end. Honestly, though, Liz, I thought the zucchini was the best part. Definately NOT tender/crisp, though! I am going to make it tonight. Hubby has a pal over to watch baseball. It turned out well. I think my oven must be hotter than the temperature I set it at though, they were very brown. Zucchini was soft but still delicious. I have 4 cups left over to add to a rice stir fry pasta. I sure found out when helping our my folks how differently ovens cook! I made some of my leftovers into a lentil soup but it was maybe a little too hippie/healthy for me! Mabye I should have used some wine in it! Hi Robin, they were quite fabulous, if I do say so myself! Love this – and I think I already have all the ingredients! Woo! Glad you liked them! These are probably going to become a staple at my house!